Simcha Goldin, father of Lt. Hadar Hy"d blames government for not using capabilities in attempt to return bodies of soldiers held by Hamas. 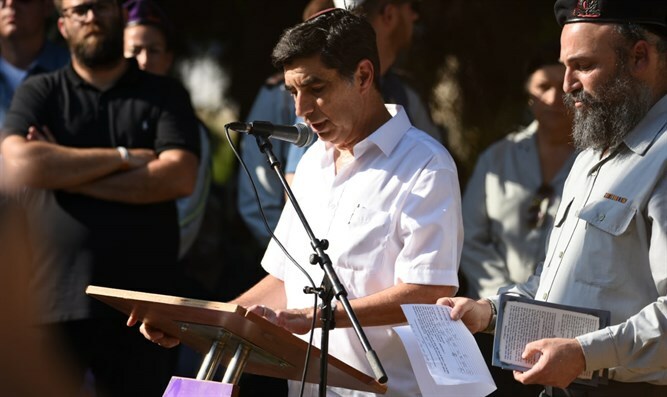 Simcha Goldin, the father of Hadar Hy"d, accused Prime Minister Binyamin Netanyahu of lacking determination to retrieve his son's body. "It falls precisely with the Prime Minister: in the State of Israel, where there's an army of the people, the one who sends soldiers into battle and who must return them is the Prime Minister," Goldin told Arutz Sheva. "If the Prime Minister acted so determinedly, there'd be no kite terror and there would be deterrence. Israel doesn't place returning the soldiers as a condition in a way that Hamas understands, they simply continue to give Hamas what they want," he adds. "We, the Goldins, will see to it that there's no longer a situation in which a war ends, the enemy holds soldiers alive or dead, and the government and its leader don't demand them back," he said. Goldin does not lose hope of returning his son's body. "I really hope that the window of opportunity doesn't close. It depends very much on pressure the Prime Minister will exert on Hamas and the determination with which he brings up the issue of Hadar and Oron before any arrangement with Gaza. Just as President Trump received the POWs and martyrs from North Korea before any talk, that's what should happen with us."